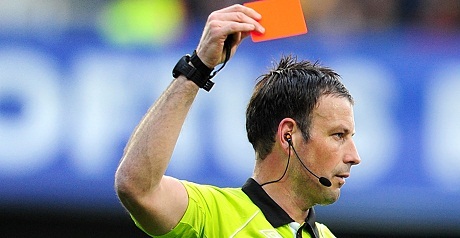 Mark Clattenburg’s performance could end up deciding not only the outcome of Sunday’s game, but the title race itself. That may sound like an exaggeration. but it’s not so far-fetched. If Chelsea had completed their recovery from 2-0 down and won the game, they would have been seven points clear of United. Instead, Clattenburg helped the visitors to victory and the gap is just one point. That’s a six-point swing. Four times in the past nine years the gap between these two clubs at the end of the season has been six points or fewer. People say decisions balance themselves out over the course of the season, and sometimes they do. In the return fixture at Old Trafford two weeks before the end of the season, United would have to be level with Chelsea but laying siege to the Blues goal and looking like the certain winners, only for two players to be sent off within six minutes – one for being fouled – and then with Chelsea outnumbering United by 11 to nine, we’d be awarded a late winner that is clearly offside. It won’t happen. And that illustrates how harshly Chelsea were treated at the weekend. Of course, the Blues didn’t help matters by giving a team as good as United a two-goal start in the first 12 minutes. The first 20 minutes of the game showed a flaw in the system that has given Chelsea such a great start to the season. The fluidity of movement between Juan Mata, Eden Hazard and Oscar has meant opposition defenders can never be sure who is going to turn up where and have found it so hard to track their movement. But when you are on the back foot against a team playing with width, having a trio of players interchanging does not provide the same sort of support for full-backs that you get from traditional wingers. And it showed as United carved their way through Chelsea’s left with embarrassing ease. At that point I feared we could lose by a distance but instead Chelsea imposed themselves on the game and there was only one team in it for the next 45 minutes. Chelsea pulled level but only a string of great saves by David De Gea and the odd moment of good fortune – such as when Jonny Evans diverted a cross on to his own post – stopped the lead changing hands. 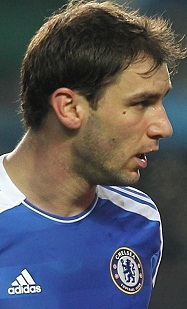 In the 45-minute spell up to the moment Branislav Ivanovic was rightly sent off, United did not have a meaningful shot on goal. Even down to 10 men you felt we still might win. But then came that sending off of Torres, who was clearly fouled by Jonny Evans. Down to nine men it always seemed unlikely we would hold out for more than 20 minutes. But just in case we did, United were given a winner despite Javier Hernandez being offside. Chelsea’s fantastic start to the season has seen us pick up plenty of points we dropped last season. We’ve beaten Arsenal, Tottenham, Newcastle and Wigan in fixtures we didn’t win last year and after nine games we have nine more points than we took from the equivalent fixtures last term. But despite that improvement and the scorching start to the season, we are still only one point clear of the two Manchester teams at the top of the table. That shows what a huge task Chelsea face if we are to win the league. We can’t afford to have referees gifting points to our rivals. Moan and sulk on. Beware the Ides of FA! I shall like Clattenberg even more if he does cost Chelsea the title. And you Manchester united fans – In 2010 at Old Trafford, Didier Drogba was indeed offside when he scored Chelsea’s second goal in a 2-1 win. And Federico Macheda scored Manchester united’s goal with his hand. So if both had been disallowed, as they probably should, Chelsea would still have won 1-0 and won the title. So if you are going to quote only the Drogba goal from that game and say I’m not offering the full story – well neither are you. But in some ways you prove me right anyway – key decisions in matches between the top clubs can decide where teams finish. Which is entirely my point. The refs have been helping redfaced to win all the time. Need convincing?Read todays Daily Mail and read the reports of MU’s games with its closest challengers. Not only that. The FA is indirectly responsible. Terry’s ban was timed to coincide with last night’s game.That is why red faced for all his stranglehold on the epl can’t improve on his 2 cl trophies.He will get to the 2013 cl final and will be beaten. That is the karma awaiting his club. Such a short memory James. Go back to April 2010 at Old Trafford then maybe one might think yesterday is a balancing out of decisions that have gone before. Disgraceful stuff yesterday. Imagine if a referee’s decision was to cost a team a title? What’s that you say? Martin Atkinson at the Bridge in 2009, Mike Dean in 2010, two horrendous decisions that end up costing Man Utd who lose the league by a point. Where is the mention of those in the interest of balance?